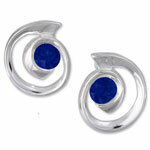 Crafted in solid 950 Sterling Silver with inlayed Lapis Lazuli. These earrings measure 0.75 inches wide. Solid Sterling Silver posts or clip closures.